You’ve seen it in mastermind groups: one member consistently makes no progress on their plans. They appear busy, busy, busy … but they’re not reaching their goals. Recently in a mastermind group meeting, a member (let’s call him Marty) shared with us how he had created some beautiful graphics for his Facebook page. Marty had taken all day to find the right stock photos and then modify them with his well-crafted text. This was clearly a task that needed to get done, and he did it extremely well. Meanwhile, Marty forgot his big vision, which was to get more speaking engagements so that he could build his audience and fill his mastermind groups. What’s happening when a member does this? Several factors could be in play: self-sabotage (for any number of psychological reasons), not clear on his real goal, no longer committed to his goal, distractions, etc. There’s one extremely common and often over-looked reason that I call Staying in Your Success Bubble. We all have things we do well, that we feel competent in doing. Pause for a moment, close your eyes, and list for yourself five things you do really, really well. Now pause and ask: How did it feel when you were thinking of those five things? I bet it felt great! These are five tasks that you can do seamlessly, flawlessly. They’re not necessarily effortless, but your confidence level is extremely high that you can complete these tasks or use these skills with ultimate effectiveness. Are these the right things to be doing NOW, in order to complete your goals? Are you the right person to be doing these tasks? Marty did the right task, at the wrong time. He did it because he was extremely comfortable in creating graphics, and not so comfortable trying to book speaking gigs. Marty stayed in his success bubble, where he felt confident and competent, and used the excuse that the graphics needed to be completed as his reason for working on them, while he let the more important and strategic task slide. A smarter move would have been to outsource the graphics work to someone else, and spend his time prospecting for speaking engagements, creating proposals, and contacting past speaking clients to ask about new opportunities. What do you do when a mastermind group members stays in their success bubble? Let the member know what he’s doing; cite specific examples. Ask him what it cost him to do the right task at the wrong time. Ask him if this is a pattern in his life. Ask him if he’s the right person to be completing that task. Can he delegate it to someone else so that he can focus on more strategic tasks – tasks that only he can do? Ask him to create a 3-task project plan of the next three tasks to be completed so he can move forward on his big goal. Get him to select only the next three tasks so that he’s forced to prioritize and focus. Moving outside our success bubbles requires personal growth. We must shift our habits, our thinking, and our patterns so we can move towards our vision. After all, that’s what mastermind groups are all about, isn’t it? 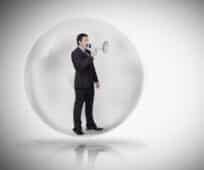 Help your member release himself from his Success Bubble and watch amazing things happen! P.S. This is why you want to take complete notes about every mastermind group meeting. If Marty had only done this once, it would be a minor problem. But Marty had done this multiple times over the course of a year, and a pattern clearly emerged by reading through my notes about him.